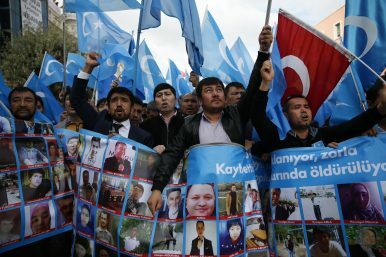 People from the Uyghur community living in Turkey, carrying flags of what ethnic Uyghurs call "East Turkestan," chant slogans during a protest in Istanbul, Nov. 6, 2018. “Son, they are taking me.” Those were the last words 34-year-old Kuzzat Altay heard from his father, in a WeChat message almost exactly a year ago. His father, a 67-year-old Uyghur in Xinjiang, is believed to be among the estimated 1 million people forced into political prison camps, sometimes referred to as re-education camps, in China’s northwestern region, in the most severe crackdown on human rights since the Cultural Revolution. In the Uyghur cultural center Altay runs in the U.S. state of Virginia, he asked a gathering of 300 Uyghurs who has family members in the camps. Every single hand went up. “The main centers in our cities – our equivalent of New York’s Times Square or London’s Trafalgar Square – are empty,” he explained. There are checkpoints every hundred meters, every mobile phone is checked and monitored, and there is no way to send pictures or videos over the phone. Tens of thousands of children, some as young as three years old, are rounded up and placed in state-run orphanages where they are subjected to brainwashing. They are denied the right to speak their own language, practice their religion, eat their food, and will probably never see their parents again. Our women are being forced to marry Chinese Communist Party officials. People don’t even have the freedom to breathe. Uyghurs are arrested and sent to the camps for acts as basic as having WhatsApp downloaded on their mobile phones, having relatives living abroad, accessing religious materials online, having visited particular countries, or engaging in religious activities – sometimes no reason is given at all. They have no access to legal counsel, no mechanism for appeal, and often the family are not told where the detainee is held or when they will be released. I was taken to a cell, which was built underground with no windows … There were around 60 people kept in a 430 square feet cell … We had seven days to memorize the rules of the concentration camp and 14 days to memorize all the lines in a book that hails the Communist ideology ….They forced us to take some unknown pills and drink some kind of white liquid. The pill caused us to lose consciousness … I clearly remember the torture …. I was taken to a special room with an electrical chair … There were belts and whips hanging on the wall. I was placed in a high chair that clicked to lock my arms and legs in place and tightened when they press a button. My head was shaved … The authorities put a helmet-like thing on my head. Each time I was electrocuted, my whole body would shake violently and I could feel the pain in my veins. I thought I would rather die than go through this torture and begged them to kill me. As if incarcerating a million people in torture chambers was not enough, there are increasing concerns that Uyghurs are subjected to DNA tests, and an unknown number of Uyghurs have been forcibly transported to other parts of the country, including Heilongjiang province in northeast China. These twin practices arouse suspicion that Uyghurs may be targeted for forced organ harvesting, or biometric surveillance. The persecution of the Uyghurs is not new. For decades they have faced repression at the hands of the Chinese Communist Party. Altay recalls being arrested at the age of 18 because, despite being the nephew of exiled Uyghur leader Rebiya Kadeer, he had managed to obtain a passport and was planning to leave the country. “The guard told me: ‘The only thing that will come out of the cell is your rotten corpse,’” he said. If it is not yet a genocide in legal terms, all the evidence points to a cultural genocide, crimes against humanity, and mass atrocities on a grave scale. For this reason, it is time for the international community to act. Last week a group of human rights organizations called on the United Nations to establish an international fact-finding mission to investigate, and countries should unite to put pressure on China to stop this horrific campaign of terror. Too many governments are scared to stand up to China, because of economic interests, but there must come a point where enough is enough. “China is a paper dragon. It looks strong from the outside, but internally they are bleeding. If countries come together and take a stand, it will save lives,” believes Altay. Failure to act now will not only lead to the destruction of the Uyghurs, but it will give Xi Jinping’s regime a green light to move on to its next targets. While the Uyghurs are currently facing the most egregious persecution, it is in the context of the worst crackdown on human rights more broadly in China – against Christians, Falun Gong practitioners, Tibetans, human rights lawyers, dissidents, civil society, and the erosion of Hong Kong’s basic freedoms and autonomy too – and the Chinese regime’s increasingly aggressive attitude toward critics beyond its borders. It is therefore in no one’s interests to turn a blind eye to the unfolding tragedy in Xinjiang. After the genocides in Rwanda, Srebrenica, and Darfur, we were told: “Never again,” too late. We have just marked International Holocaust Memorial Day. Let us not find ourselves saying in a few years’ time of the Uyghurs those words “Never again” all over again. Benedict Rogers is a human rights activist and writer, working for the international human rights organization CSW. Will any of China's neighbors speak out against its abuses at home? A major UN review offers a sobering assessment.